Erin Brockovich. 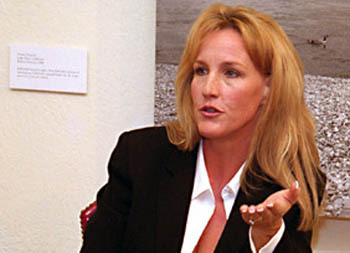 No, not Julia Roberts in the movie version, the real Erin Brockovich who took on the Bad Guys and won. Sure she's voluptuous, but the fact that she's smart and courageous and determined makes her all the more alluring. But she's charming, too; I saw her a while back in a documentary about cleaning up a city park in New York and she was positively radiant. Joyce Carol Oates, who writes with extraordinary passion about seemingly ordinary people in her novels. She can write with utter conviction from either gender viewpoint, as witness We Were the Mulvaneys and Middle Age. And in her essays, as in her novels, there's a truly independent mind at work -- not one of those ideological wind-up toys that seem to dominate talk radio and Academe. Irish McCalla. Before your time for most of you. She played Sheena, Queen of the Jungle on TV back in the fifties, and died a couple of years ago. I haven’t seen the show in ages; it was probably lousy. But it offered an early heroic image for women. And McCalla was the heroine of her own life, a single mother who used the money from the show and B movies to raise her son, put herself through art school, and pursue a successful career as a commercial artist. Peggy Shannon. Even ancienter history. She was a swimming champion turned actress back in the 1930s. In a 1933 disaster movie called Deluge (so obscure today that the only surviving print is one dubbed in Italian), she played a strong and courageous woman who fought for herself and her man instead of just standing on the sidelines. But she was before her time, her career went nowhere, and she died young in despair. If only she were of our time, to star as a true Vel…. C.L. (Catherine Lucille) Moore and Leigh Brackett were the two greatest women writers of science fiction's Golden Age. They were pioneers in writing about heroic women too, Moore with her Jirel of Joiry fantasy tales and sf works like Judgment Night (an anti-war novel published during World War II! ), Brackett with heroines like Beudag in "Lorelei of the Red Mist" (set on an impossible Venus with seas of red fog) and Ciaran in "People of the Talisman," one of her fabulous Martian tales. Moore wrote some of the greatest idea stories ever, like "No Woman Born" and "Vintage Season." Brackett went on to write for films, including The Big Sleep and The Empire Strikes Back. In recent years, their works have become available again in print and in Kindle. 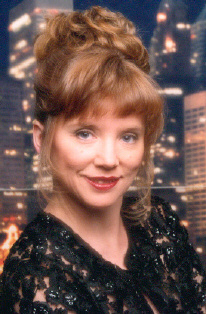 How could we leave out Lisa Binkley? As Jolie Howard, she is author of some of the very best contemporary sf and fantasy -- novels like As Pretty Girls Do, The Secrets of Katie Zorin and Emerald City: The Keep, plus any number of excellent short stories. They're just incredible! But you won't find them at Barnes & Noble or on Amazon -- only online (See Jolie Howard Archive under Links). Kathryn Bigelow is unique among Hollywood filmmakers: a woman doing what most would consider "men's movies." Her most recent major feature was Zero Dark Thirty, about the hunt for Osama Bin Laden. Before that was The Hurt Locker, centering on men doing dangerous work defusing bombs in Iraq. She first came to wide notice with Near Dark, a dark thriller about a bunch of Texas redneck vampires, unlike any other vampire movie you've ever seen. She scored again with K-19, the Widowmaker, the harrowing true story of a nuclear accident on a Soviet submarine and the heroic efforts of the crew to overcome it, at a time when the Soviet régime didn't want to admit such an accident was possible.